Yesterday, the community brought Nouredim Mohamed to his last rest. Very emotional, I must admit. After Breakfast, so at around 11.00, we began, to come together in the Park. The Police came at one time with three officers through the Park and occasionally came through by car. But, they let the community alone. 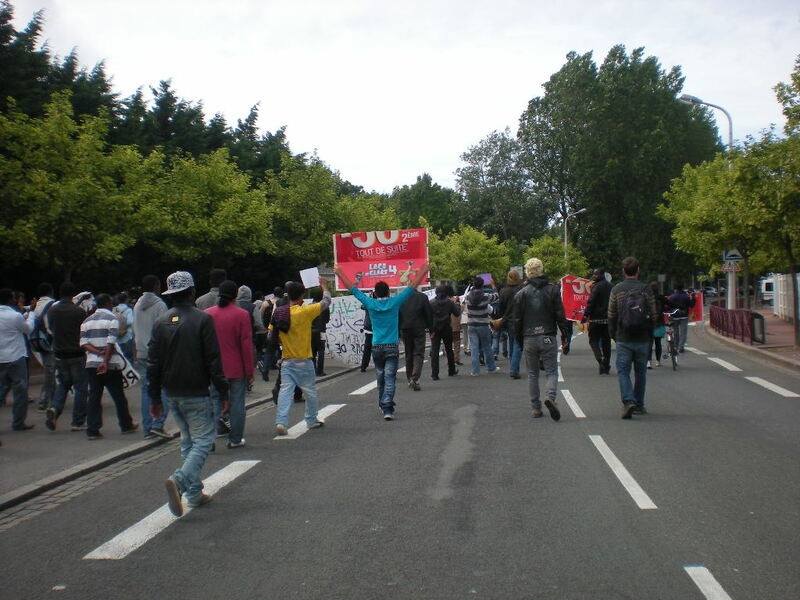 At around 15.00, the community marched with 50 to 70 people to the cemetery. Again, one police car watched us, but let us alone. Also, at the cemetery. We assembled behind the van with N. in. At 15.30, we marched behind the Van onto the cemetery. There, the community got the coffin out of the Van and marched N. around. Then, they set the coffin down. The Imam assembled Muslims in strict order. When he was pleased, he began with prayers. After the ceremony, the community let the coffin in the grave. Then, all together buried N. Then, the Imam hold another, short, ceremony. Afterwards, all came together outside the cemetery. There, Banners were given out. One higher copper and two BAC (Undercover police) came through the crowd, to warn us, that we getting charged, if we enter the road. We have to walk on the pavement. Around 60 people marched off. At the begin, all was calm, we walked more or less on the pavement. The motor bike Cops tried to push people back on the pavement. After a while, we had enough of this and decided, to take the road. Police stayed very calm. We then marched to the place, where N. apparently died. There, so was it planned, would we have another little ceremony. But the community decided, to marsh on. Not to much good. Around 500 metre on, a line of Robo Cops blocked our way. Again, for Calais very calm, apart from a bit pushy/ shaffy, not much from the boys in blue. We marched then on another way back to the park. There, after a bit of discussion, the community decided, to call it a day. Most droved to Secur Catholique, to eat and to think for a date for the sacrifice. Some stayed in the Park, drunk and eat a bit and waited for our Fooddistro opposite SALAM. This happened at 18.30.